World War II in Pictures: 12th SS Panzer Division "Hitlerjugend"
There are few German formations surrounded by as much legend and notoriety as the Hitler Youth Division. There is very good reason for that. The 12th SS Panzer Division "Hitlerjugend" was one of the premier formations of the entire Third Reich military apparatus despite being composed largely of boys below the age of 18. Let's take a look at the 12 SS Panzer Division's history, from birth to death. First things first: the 12th SS Panzer Division has the "SS" in its name because it was not an ordinary Wehrmacht outfit. Instead, it was an auxiliary to the German Army (Heer). 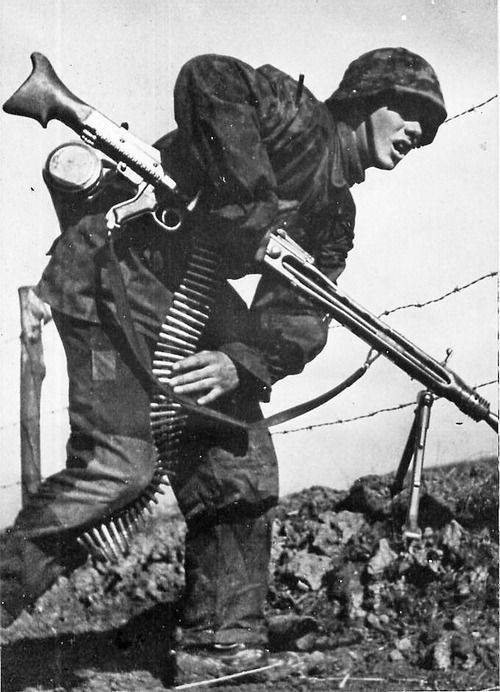 As a general matter, SS fighting (Waffen) divisions began proliferating as the war progressed due to necessity: military skill began to take a back seat to political reliability, and the SS units were reliable. The SS (Schutzstaffel," or "Protective Squadron") was not originally intended to form fighting units, and Adolf Hitler was opposed to the idea of integrating these ideologically pure men into the Heer, so they were kept separate from regular units. SS unit operations were under the control of the OKW (Oberkommando der Wehrmacht), as distinct from the Oberkommando des Heeres (OKH) which controlled most Heer units. This gave the SS units wide latitude to chart their own tactical course. It also gave them special channels to the high command to blame defeats on the regular army units. The SS units fought well, but erratically. 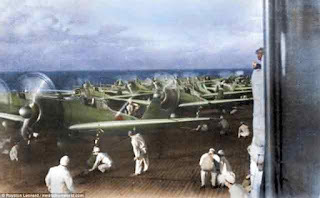 If an attack plan called for a dawn start, the SS troops might get to it around then... or they might begin at noon after they had "fully prepared" themselves. The SS units had fierce, uncompromising fighters, but their leaders were often untrained and lacking in skills considered basic in the Heer. For instance, an SS unit might attack frontally with extreme savagery, sustaining heavy casualties and panzer losses, whereas a Heer unit might make coordinated flank attacks and attain the objective with minimal losses. SS units were resented by the ordinary Wehrmacht soldiers because the SS received priority for equipment and replacements. Further, the SS units tended to follow their own paths without regard to the needs of the Heer units relying upon them, and SS men were known to perpetrate war crimes that often disgusted the Wehrmacht. 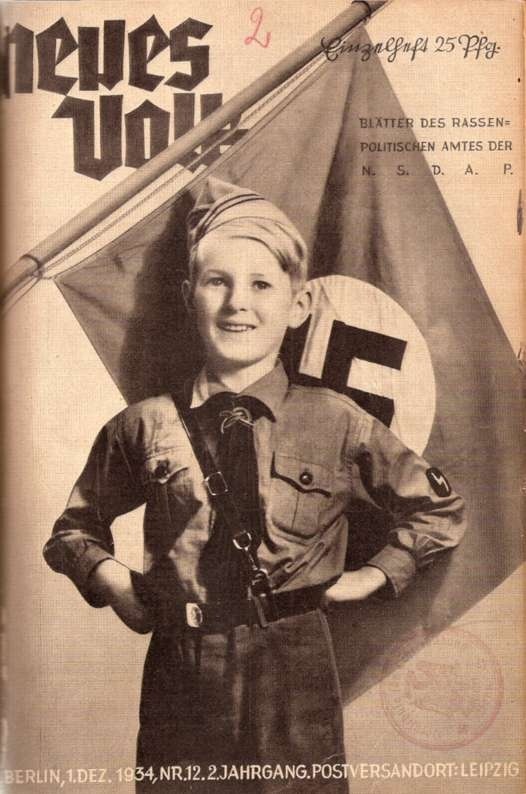 Gottlob Berger, an aide (SS-Gruppenführer) to Reichsführer-SS Heinrich Himmler, came up with the idea of a Hitler Youth Division in January 1943. It was the time of Stalingrad and the onset of "Total War," so any idea that might work was quickly accepted. An order went out on 13 February 1943 creating what would become the 12th SS Panzer Division, to be composed originally of the Class of 1926 (16- and 17-year-olds). Gottlob Berger. He was known ironically (behind his back) as "Praise God" due to his first name. Berger was chief of the powerful SS Central Office from 1 April 1940 until the end of the war, sort of Himmler's version of Wilhelm Keitel. 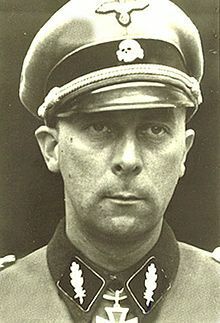 He oversaw the dramatic expansion of the Waffen SS via the creation of special units such as the Hitlerjugend Division. (Ang Federal Archive).. The 1st SS Panzer Division (the "1st SS Panzer Division Leibstandarte SS Adolf Hitler," or LSSAH) provided the core personnel for the 12th SS Panzer Division. 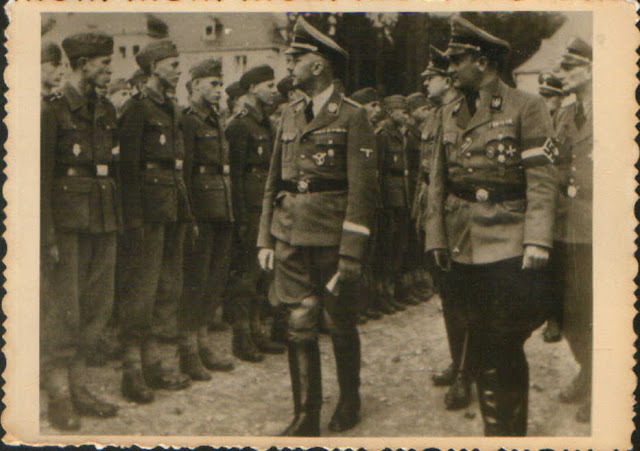 In addition, some 50 Heer officers were recruited to serve as SS officers in the formation (these men continued to wear their regular army uniforms). The LSSAH was one of the most fanatical formations in Hitler's Germany, and the officers and men taken from it (some 2000) imbued the 12th SS Panzer Division with its characteristic ruthlessness. Troops of the Leibstandarte. It originated as a spit-and-polish unit for the protection of Adolf Hitler. It evolved into a savage Waffen-SS outfit. This picture must have been taken late in the war, note the presence of an apparently Asian soldier. 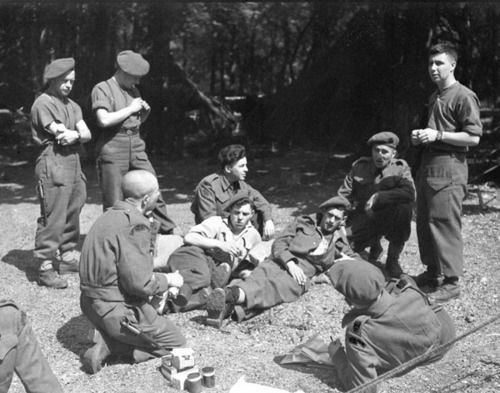 Staffing and training took place in Beverloo Camp, Belgium. 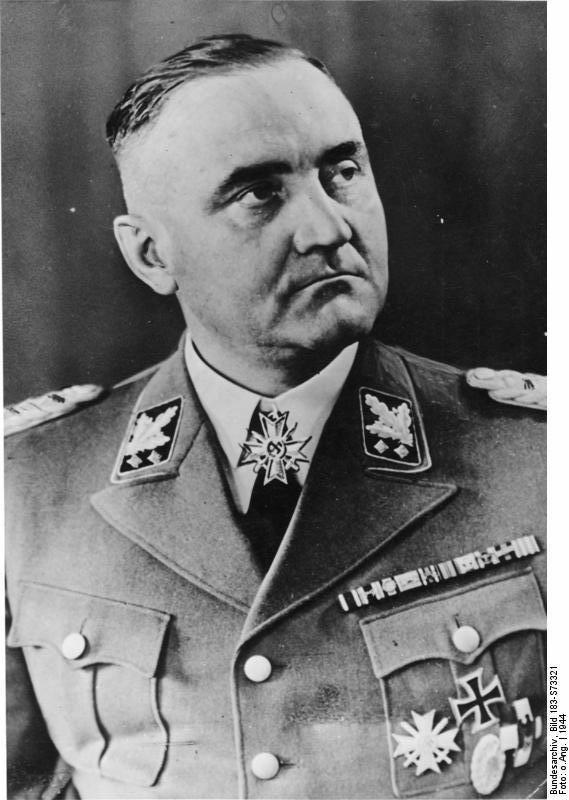 Waffen SS Brigdeführer Fritz Witt (NSDAP #816,769/SS #21,518) became the unit's commander as of 1 July 1943, at which point he was promoted to SS-Oberführer. Witt was a charismatic leader largely responsible for the division's esprit de corps. He realized that the division needed to be combat-ready quickly, so he ignored many onerous rules and regulations. Heinrich Himmler and Arthur Axmann inspect the 12th SS Hitlerjugend. Instead, he focused on realistic combat scenarios and live-fire exercises. 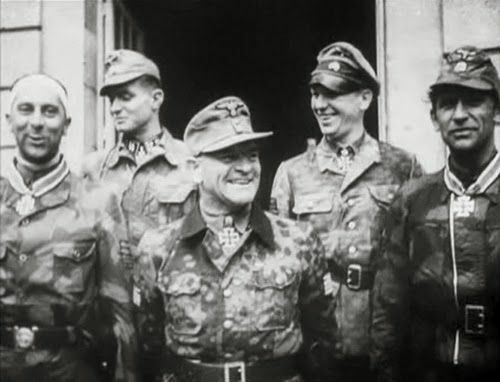 The relationship between the officers and men in the 12th SS Panzer Division was an informal one, based on mutual trust and respect, and this caused many of the boys to stay at their guns long past the time that others would have fled. 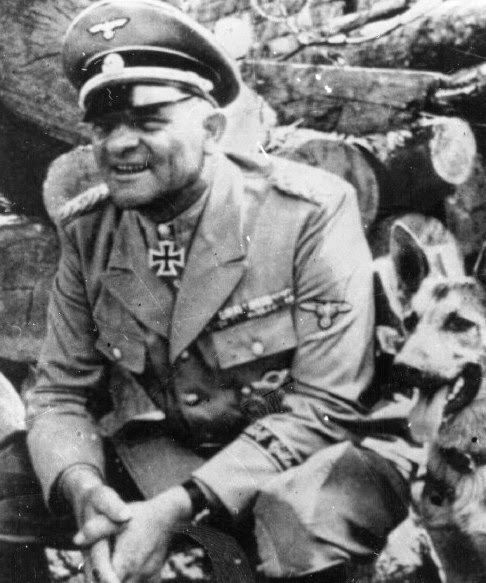 Fritz Witt with his dog. The official name 12th SS Panzer Division was bestowed upon it in October 1943. By Spring of the following year, the division was staffed and equipped, so it moved out of its bivouac to Caen in Normandy to join the 1 SS Panzer Corps. Its placement there would be pivotal to the course of the war. Hummels of the type that would have equipped the 12th SS Panzer Division. Hummel (German: "bumble bee") was a self-propelled artillery gun based on the Geschützwagen III/IV chassis, armed with a 15 cm howitzer. It was used by the German Wehrmacht during the Second World War from early 1943 until the end of the war. The 12th SS Panzer Division was an armoured formation, but it was not a heavy panzer division. Thus, it was equipped with medium panzers such as the Panther (66) and Panzer IV (over 90). Its tank complement was roughly of half what a fully staffed panzer division would have had in the early stages of the war, but what it had was far more than most other panzer formations at that stage of the conflict. 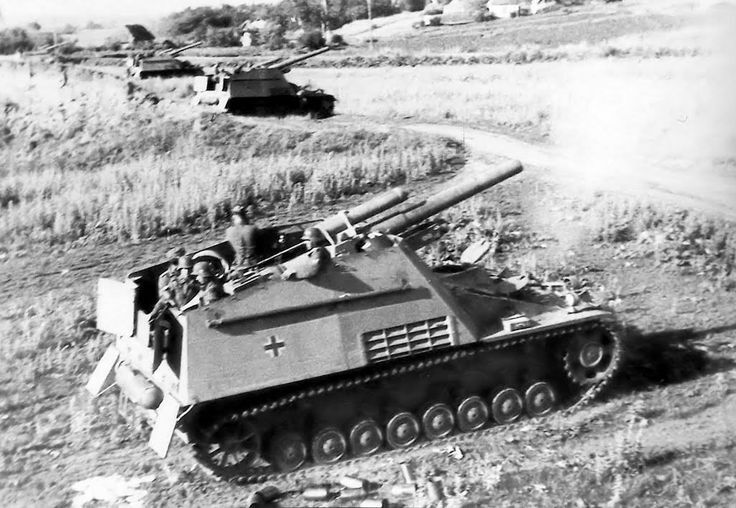 In addition, there was the usual assortment of tank destroyers (Jagdpanzer IV, Wirbelwind, Hummel, Wespe, 15 cm sIG 33 infantry guns) accompanying the panzers. While en route to Caen on or about 1 April 1944,, the 12th SS Panzer Division passed through Ascq, France. The railway line the division was using was sabotaged. This was quite common at the time, but SS Divisions were known for taking such incidents personally. 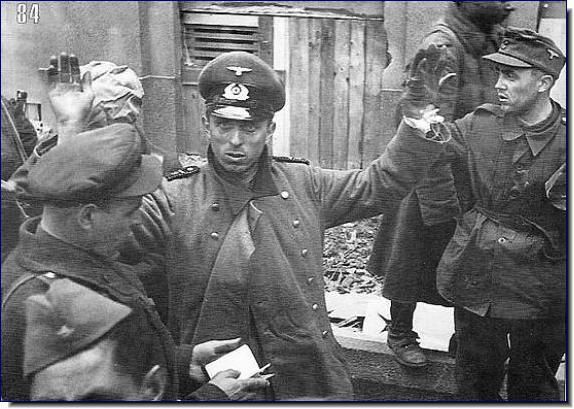 SS-Obersturmführer Walter Hauck ordered all civilian males near the scene to be arrested and shot, some 86 men in all. The 12th SS Panzer Division then continued south under commander Witt and established its headquarters at Venoix 2 kilometers southwest of Caen. The 12th SS Panzer Division remained encamped near Caen until Operation Overlord, the Allied invasion of Normandy, on 6 June 1944. Caen was a key objective of the British troops landing at the eastern end of the landing beach, and the 12th SS Panzer Division defended the city. This began a 10-week struggle between the British and the 12th SS Panzer Division which forms the heart of the division's legend and notoriety. The 12th SS Panzer Division moved to the front on the afternoon of 6 June after finally receiving orders from Berlin, opposing the British near Sword and Juno beaches. Panzer Meyer and fellow officers at Ardenne Abbey. As noted above, the 12th SS Panzer Division had been imbued from its creation with extreme ruthlessness. This was demonstrated on 7 June 1944, when members of the 12th SS Panzer Division committed an atrocity against Canadian and British prisoners of war, shooting 11 (some say over 30) captured soldiers in the back of the head at Ardenne Abbey. The massacre took place in the courtyard of his own headquarters, so he could hardly say that he was unaware of it. 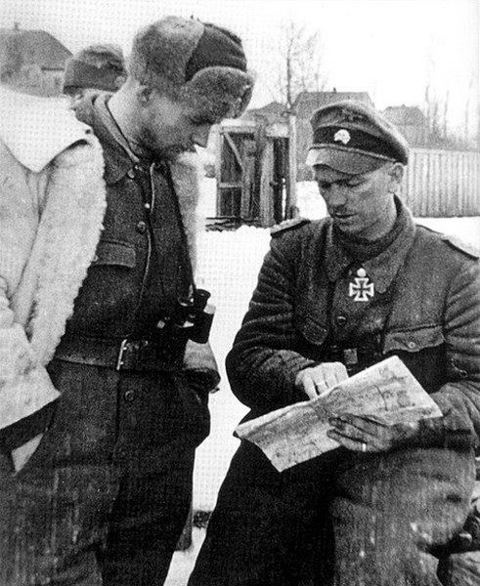 Max Wünsche and Panzer Meyer in Kharkov, Ukraine. 12th SS Panzer Regiment (Max Wünsche). Both Meyer and Wünsche are legendary/notorious names in the Wehrmacht. They were hard-bitten veterans of the Eastern Front who spared neither themselves nor their troops. 18-year old Corporal-SS Otto Funk of the 25th Grenadier Regiment of the 12.SS Panzer Division "Hitlerjugend" after a failed attack on Norrey-en-Bessin, north-west of Caen, France, June 9, 1944. Corporal Funk survived the war and died in 2011. At one point at Kharkov, Meyer was surrounded by Soviet troops. 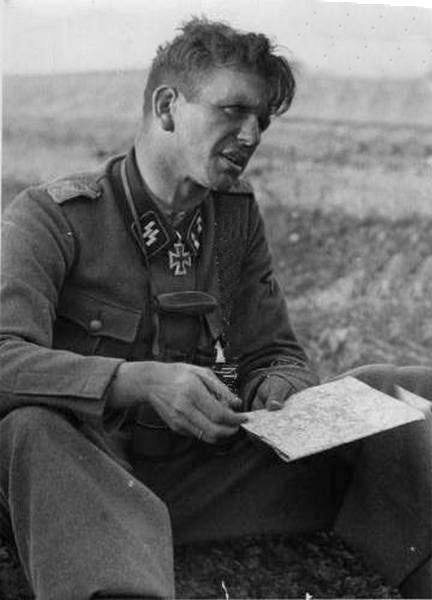 Wünsche broke through, then, instead of simply bringing Meyer and his men back, advanced further through Soviet forces before escaping to German lines. Both men survived the war. 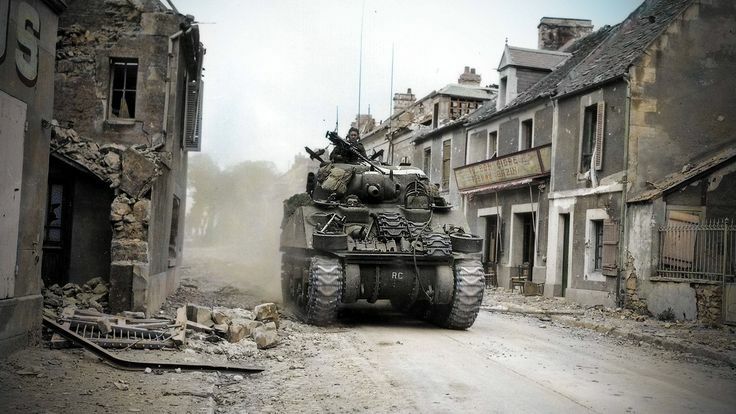 M4 Sherman tank of the Sherbrooke Fusiliers advancing in Caen, Normandy. 10th July 1944. While legend has it that the Germans never counter-attacked Normandy, that is not quite the case. In fact, Meyer's regiment took back the towns of Authie and Franqueville from the North Nova Scotia Highlanders of the 27th Tank Regiment (Sherbrooke Fusiliers) on 7 June. The British forces were forced into a hard defense of nearby Buron which succeeded. Wilhelm Mohnke. He was one of the original SS, an original member of the SS-Staff Guard in March 1933. 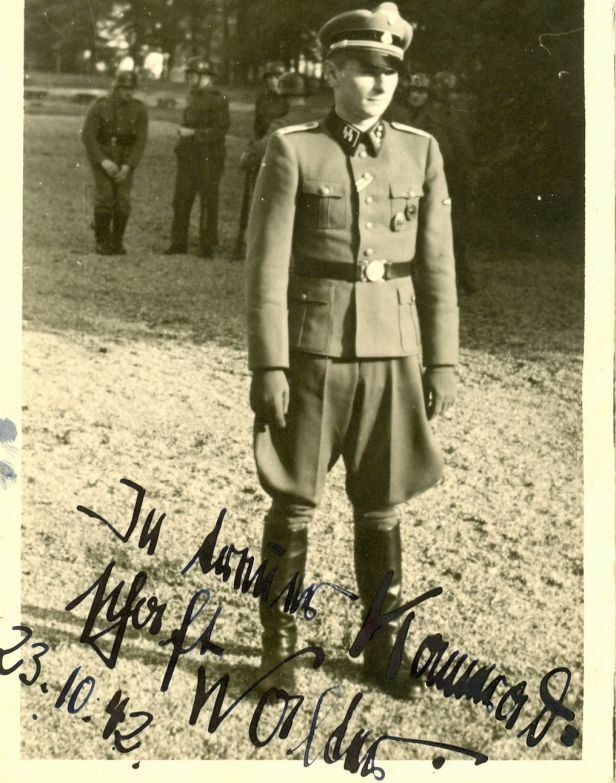 After commanding the 26th SS Panzergrenadier Regiment, Mohnke went on to command the Berlin garrison in April-May 1945. He was one of the last to see Adolf Hitler, and passed away in August 2001. A third regiment, the 26th SS Panzergrenadier Regiment, under the command of SS-Obersturmbannfuhrer Wilhelm Mohnke (later famous as the last commander of Berlin), then attempted further counterattacks to straighten the German line. The attempt failed because the attack was made head-on without any attempt at strategy, such as flanking actions. This was a common failing of German formations in the final year of the war. Infantrymen of The Royal Winnipeg Rifles preparing to embark for the invasion of France. England, 1 June 1944. The 26th SS Panzergrenadier Regiment launched another counterattack around the same time, against the Royal Winnipeg Rifles in the town of Putot-en-Bessin. After some back-and-forth with the town changing hands, this counterattack also failed. As time passed, the British received reinforcements that made further German initiatives to dislodge them unachievable. 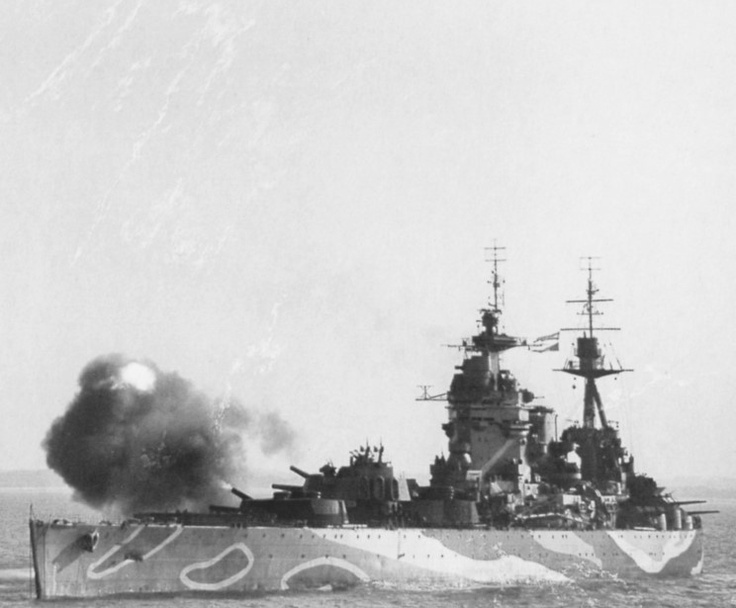 Battleship HMS Rodney fires its guns off the coast of Normandy, supporting the D-Day invasion. Naval gunfire support was critical throughout the Normandy campaign. The two sides then settled into essentially static positions which lasted for the remainder of the campaign. The Allies had complete aerial dominance. In addition, they also used naval gunfire to reach German positions many miles inland. Naval guns killed Witt at his headquarters on 14 June, and Panzer Meyer was appointed to command the entire 12th SS Panzer Division. Troops advancing during Operation Cobra. Various local actions, such as Operation Jupiter on 10 July, dominated the Caen fighting until Operation Goodwood, the British attempt on 19 July to break through and annihilate the 12th SS Panzer Division. This is a young machine gun team member from the SS Panzer Division 12th "Hitlerjugend." 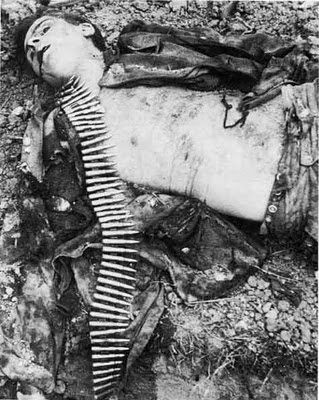 He was killed near a ditch in the Malon, Normandy, July 9, 1944. This operation failed, but it did draw off reserves from further south that no doubt aided the successful Allied breakout at Avranches (Operation Cobra) at the end of the month. 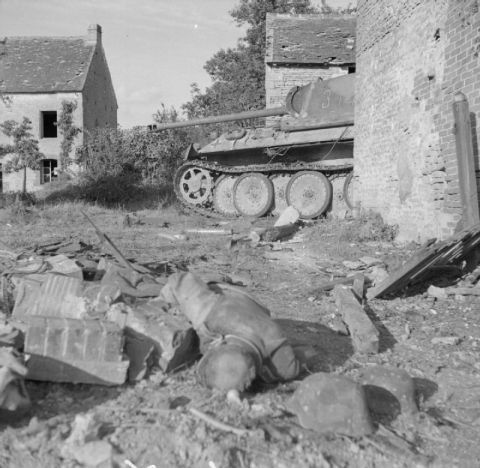 Death and destruction: a knocked-out German Panther tank and a dead infantryman in the Falaise pocket, 25 August 1944. While Operation Cobra sent Allied tanks deep into France, the 12th SS Panzer Division still held its position against the British. A series of Allied operations then followed (Operation Totalize on 8 August, Operation Tractable on 14 August) to destroy the division. While casualties mounted, the 12th SS Panzer Division held its position. 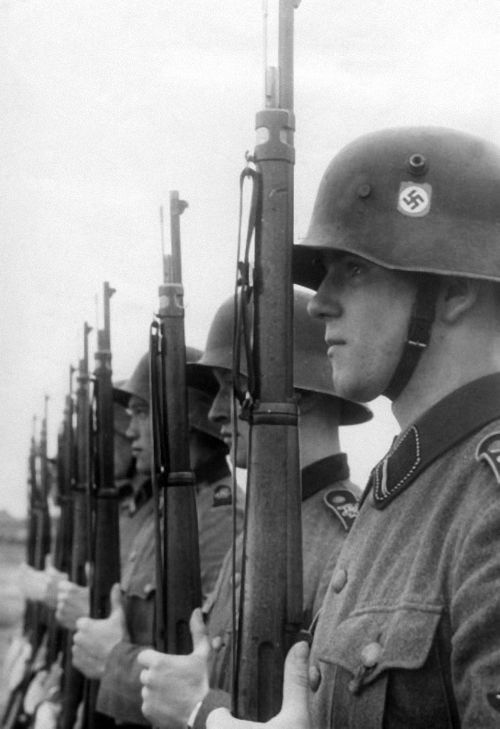 An obvious propaganda shot, but does show the weaponry of a Hitler Youth. This was positively critical to German strategy, because a British breakthrough at Caen would have closed the only retreat route for numerous formations being pushed northwards by Operation Cobra. Any breakdown in this defense would have led to complete destruction of the entire Army Group B in the Falaise pocket. Only after the German 7th Army had escaped from the trap did the 12th SS Panzer Division itself disengage and withdraw north of the Dives River. 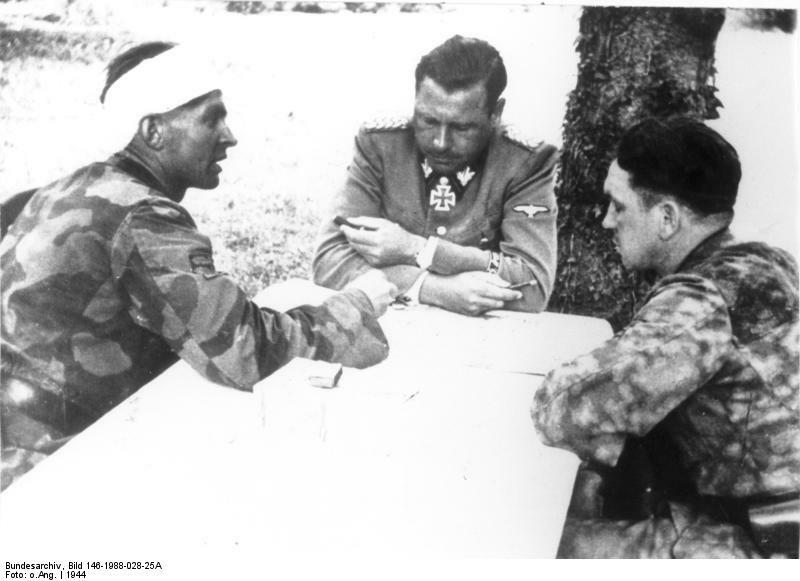 Waffen SS Brigdeführer Fritz Witt confers with Max Wünsche and Panzer Meyer in Normandy. (Ang, Federal Archive). It is impossible to convey properly the utter demolition of the 12th SS Panzer Division that occurred during those weeks of July and August 1944. Despite a steady stream of (insufficient) reinforcements, by late August 1944 the 12th SS Panzer Division had been reduced to a kampfgruppe (destroyed formation) with only 10 tanks remaining. 12th SS Panzer Division soldiers who died in combat. Just from the way that the bodies are grouped, it could have been a bomb that got them. 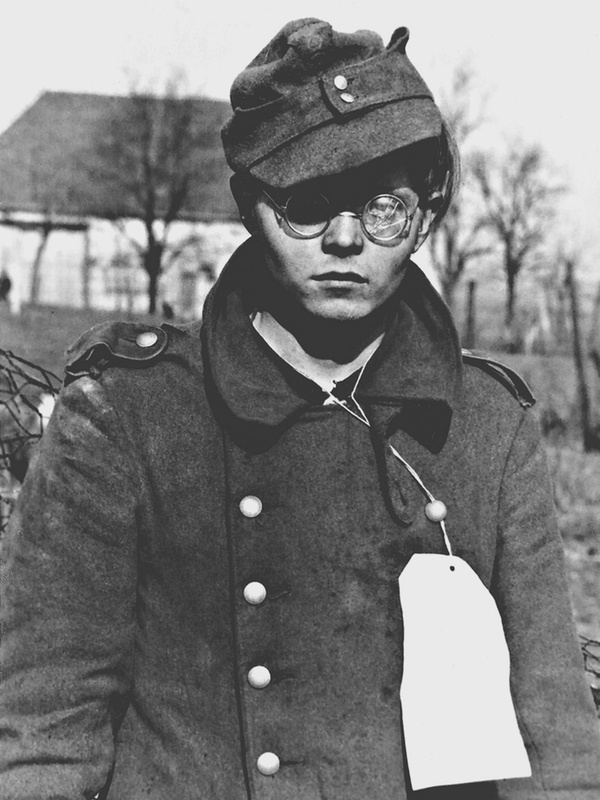 Following its heroic stand at Caen, the Hitlerjugend Division was no longer fit for combat (and, in truth, had not been for many weeks but for the determination of its surviving troops). It had saved valuable German forces that would be critical to the later defense of Holland and Germany itself. The 12th SS Panzer Division itself, though, would never be the same. A memorial held in 2007 for the victims of the massacre at Tavaux and Plomion. 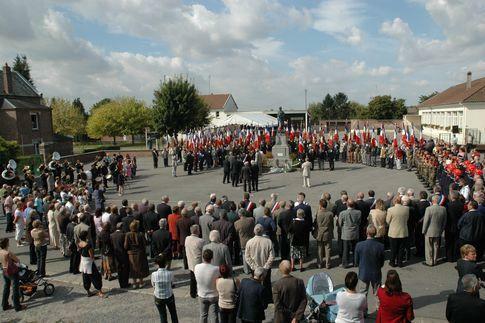 The village of Tavaux received the Medal of the Resistance. Even though the Division was decimated, it was still functional and capable of great cruelty. 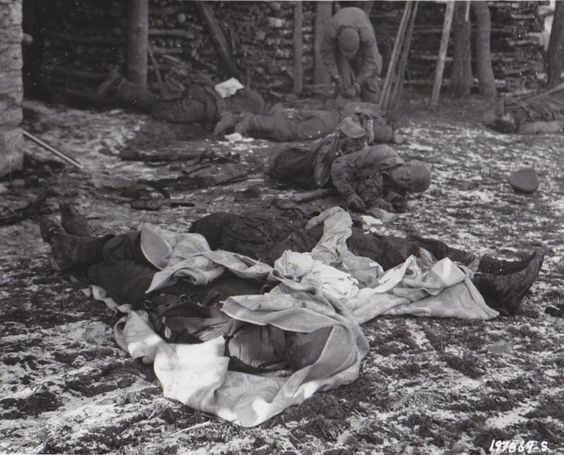 During the fighting withdrawal, the 12th SS Panzer Division committed further atrocities when it killed 34 French civilians at Tavaux and Plomion. The 12th SS Panzer Division, despite its destruction, remained in the line all the way back to the Belgian border. Panzer Meyer was captured during this period on 6 September 1944 by Belgian partisans. SS-Obersturmbannführer Hubert Meyer became the new temporary commander. With the firming of German defenses in October 1944, the 12th SS Panzer Division was re-formed at Nienburg, Germany. The new permanent commander was SS-Obersturmbannführer Hugo Kraas. The 12th SS Panzer Division returned to the front lines for Operation Wacht am Rhein, the German offensive usually known as the Battle of the Bulge. It was placed within SS-Oberstgruppenführer Sepp Dietrich's 6th SS Panzer Army. Sepp Dietrich. He was a charismatic old crony of Hitler's who was promoted due to his political reliability rather than his military competence. Some feel that his army's weak performance during the Ardennes Offensive was due in part to his mismanagement. When the German operation began on 16 December 1944, the tables were turned for the 12th SS Panzer Division. This time, the Hitler Youth were attacking and it was the Americans who were defending at Elsenborn Ridge. The 12th SS Panzer Division was stopped and prevented from achieving any of its objectives. American soldiers said that the Germans once again tended to attack head-on without any tactical subtlety, leading to massive and often unnecessary casualties in their ranks. Compared to their fanatical youngster predecessors, the replacement men who had been transferred from the Luftwaffe and Kriegsmarine displayed little of the unit's previous fierceness. Having once again suffered massive casualties, the 12th SS Panzer Division was ordered along with the rest of the 6th SS Panzer Army to Hungary to assist with the recapture of Budapest. The 12th SS Panzer Division arrived in Hungary in early February 1945, too late to make a difference. After participating in the unsuccessful Operation Frühlingserwachen (Spring Awakening) that began on 6 March 1945, the 12th SS Panzer Division soon was fighting to avoid encirclement itself. A steady move toward Vienna ensued which was a cross between retreat and wild flight. Once Vienna was lost on 14 April, the objective became to reach American lines, as the Russians were notorious for brutality to prisoners. 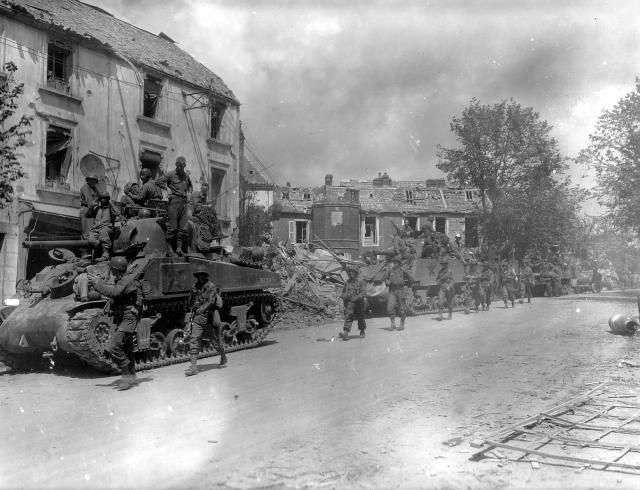 This objective the remnants of the 12th SS Panzer Division achieved by the end of the war on 8 May 1945, when the survivors surrendered to the 65th US Infantry Division commanded by Major General Stanley Eric Reinhart. The 12th SS Panzer Division suffered horrendously in each of its operations. The total casualty rate was 42%, and it lost 94% of its armour and all of its artillery. When reviewing casualty figures, always bear in mind that German divisions included extensive support networks, so only a relatively small fraction of the division was actually on the front lines. Some of those casualties were the result of poor leadership and inexperience, but by the time the 12th SS Panzer Division commenced operations, the Allied dominance in all spheres of combat was overwhelming and growing. As noted above, the 12th SS Panzer Division committed atrocities during its operations. 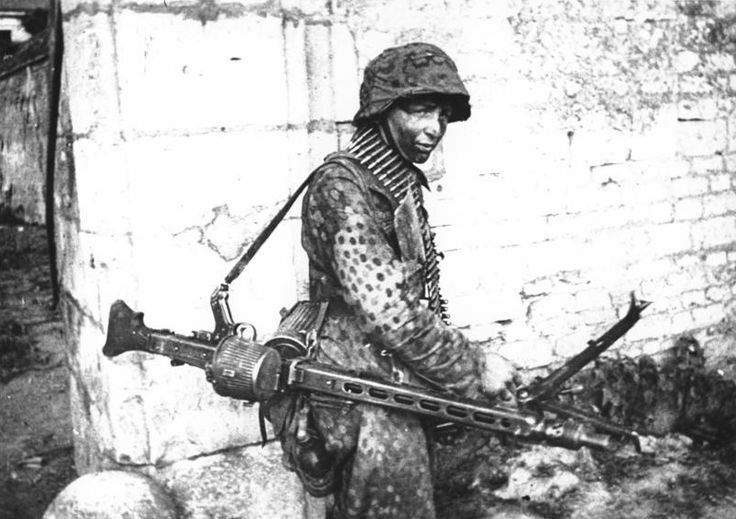 This was not uncommon with Waffen SS troops by this stage of the war. While the murder of American GIs at Malmédy on December 17, 1944 by men under the command of Joachem Peiper in the 1st SS Panzer Division is better known than the crimes committed by men of the 12th SS Panzer Division, the Hitler Youth commanders were called to account. 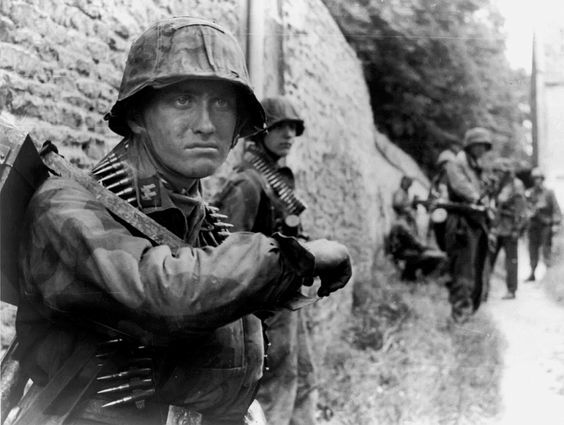 A member of the Hitler Youth Division in Normandy. Walter Hauck was put on trial in 1949 for the massacre at Ascq. He was convicted and sentenced to death, but ultimately freed in 1957 after the Allies commuted his sentence. Czechoslovakia later requested Hauck's extradition for other alleged crimes committed on May 5-6, 1945 at the village of Leskovice (25 people murdered, including 7 women and a 13 years old boy). These requests were denied in 1969, 1977 and 2005. Hauck died peacefully at home in 2006. One of the few survivors of the Hitler Youth Division. "Panzer" Meyer was put on trial in December 1945 for his role in the 7 June 1944 murder of the Canadian prisoners of war at Ardenne Abbey. He also received a death sentence, but, like so many others, soon it was commuted to life imprisonment. 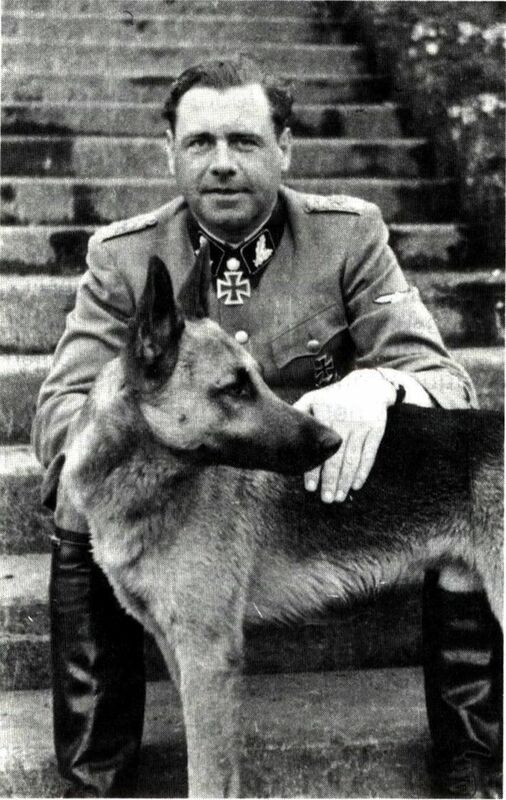 Panzer Meyer was released in 1954 and passed away in December 1961. It is said that he became quite friendly with Canadian troops after his release, walking with a limp, cheerfully attending their mess and selling them beer. The Party actively recruited... ten-year-olds. 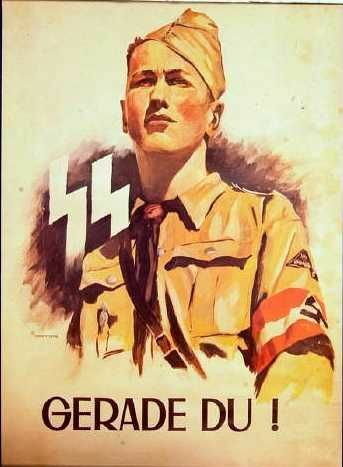 “Youth serves the Fuehrer! 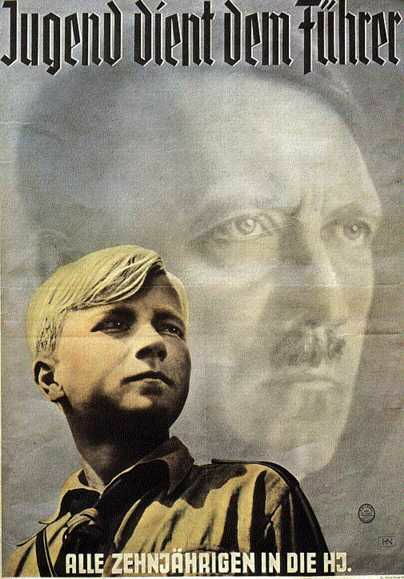 All 10 year-olds join the Hitler Youth.” For many, this is where it all began, entering the Hitler Youth in 1933-1935 as 10-year-olds and winding up in the Hitler Youth Division at Normandy in 1944.